Francis Marion Lyman was born in Goodhope, Illinois, in 1840, during the time period when the main body of The Church of Jesus Christ of Latter-day Saints was settling in Nauvoo, Illinois, and its surrounding townships. Francis was the oldest son of Amasa Mason Lyman and Louisa Maria Tanner. His father was among the first of those who began the trek from Nauvoo, Illinois to Salt Lake City, Utah in February 1846. Francis, his mother and three siblings soon followed in June of 1846. They traveled to Winter Quarters, Nebraska, where they remained until the summer of 1848. Although just eight years old at that time, Francis drove a yoke of cattle on that trek until they reached Salt Lake City in October of 1848. 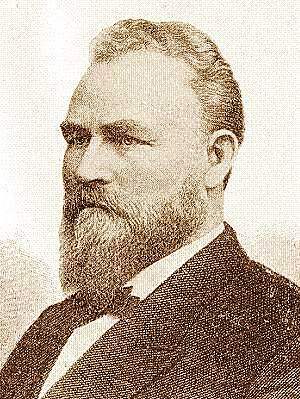 Amasa and Charles C. Rich bought land in San Bernardino, California, with the expectation that it would be a temporary home and stopping place for members of the Church. In 1851, Francis and his family moved there. Francis’ job during that trek was to take care of driving the loose stock. His family remained there until 1857, when the missionaries and those residing in Mormon communities outside of Utah were called back to Salt Lake City as a result of the Buchanan war. During that time, Francis made a total of 16 trips between the two cities for freighting. During one of those trips, in 1853, when he was in Salt Lake, he witnessed the laying of the cornerstone of the Salt Lake Temple. Francis was called to serve a mission to Great Britain in 1857, but it was delayed during the Buchanan war. In November of 1857, at age 17, he married Rhoda Ann Taylor and they soon had their first child. In 1860, he was ordained a member of the Quorum of the Seventy and was again called to serve in Great Britain, and this time he was able to fulfill that calling. As he traveled east, he stopped in Kirtland, Ohio, and was shown through the temple there by Martin Harris. Francis labored diligently on his mission. In May, 1862, he began his journey home accompanied by more than 800 converts and emigrants. He finally returned home to his young wife and child nearly two and half years after leaving. Upon returning home, Francis was asked by Brigham Young to settle in Fillmore, Utah. He remained there for 14 years, serving in various political and religious offices, including as a member of the House of the General Assembly of the State of Deseret, county clerk and recorder, superintendent of schools and prosecuting attorney. In 1869, Francis began practicing plural marriage, when he married Clara Caroline Callister. In 1873, he was called on a second mission, again to Great Britain. During he second mission he also labored in Wales, Scotland, Denmark, Germany, Switzerland and France. He returned in 1875 bringing with him a group of 300 converts. After attending the dedication of the St. George temple in 1877, Francis was called to preside over the newly-organized Tooele stake. Here again he was prominent in both religious and political fields. He was the county recorder and then was elected to serve in the legislature as the representative from Tooele County. In October, 1880, Francis was called by John Taylor, then President of the Church, as a member of the Quorum of the Twelve Apostles. He traveled frequently to cities and towns in Utah to preside over, direct and conduct Church meetings. He also kept a detailed daily journal regarding his travels and church records. Francis was also put in charge of keeping the records of his father’s family including such things as marriages, births and deaths. He was called to serve a third mission in 1883, this time to the Indians in Southern Utah. This time he was accompanied by other missionaries as well. He was not given directions as to how to accomplish this mission, but instead was told that he would receive the knowledge he needed to fulfill his calling. After bringing the matter to the Lord in prayer, he felt that he needed to go right in among the communities, speak with the agents and begin preaching to the Indians. Arriving among the Indians, the missionaries were received with marked kindness by both the Lamanites and by the agents. Not only did the missionaries receive much success through preaching, but they also worked and served alongside the Indians and benefited temporally as well. One morning while traveling and preaching, Francis was seized by a great pain in his left side. For two hours he endured the pain and suffering. He said during this time that all the good deeds and acts he had accomplished during his life were brought to mind. When it seemed that he may not live much longer, the brethren with whom he was traveling administered a priesthood blessing to him, following which he was immediately healed. Francis served as the President of the European mission from 1901 to 1904. While there, he presided not only over the missionaries, but dedicated mission homes in both Denmark and Norway. In 1930, prior to returning home, Francis became President of the Quorum of the Twelve Apostles following the death of Brigham Young Junior. While President of the Quorum of the Twelve Apostles, he was summoned to Washington D.C. to stand witness in the Abraham Smoot trial. He also accompanied President Joseph F. Smith to dedicate the Joseph Smith Memorial Monument in 1905.